while we complete our new expanded website. Check back soon! Serving Hawaii for 85 years. With solutions customized for you. Supplying Island Businesses for 85 Years. In 1933 we started selling our soap door-to-door throughout Honolulu. We’ve grown to help keep businesses clean and bright throughout the islands. For more than three generations we’ve brought you the products that you need. Some, formulated by us in our own testing lab to tackle problems specific to our islands. Others from the best sources throughout the world. We're a Secret to Success. Hawaii is our home. As stewards of the natural environment, we adhere to the letter and spirit of environmental laws and regulations at the federal, state and county levels. This applies to the products we sell as well as the advice and training that we provide. We are a trusted, local resource. Imagine having an extra employee. Someone with extensive, inside, local knowledge. One of those people who seems to know everybody. A person who you trust. Somebody who makes your job easier. That’s us. The Products, Service and Training you Need. 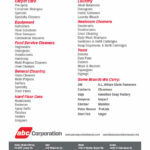 At ABC, we make jobs easier, saving you time with solutions for laundry, hospitality, food service, education, government, medical and building maintenance. Our offices are right here at home in Hawaii, So, help is just phone call away. Follow-up service, machine rentals, machine repairs, bacteria testing, OSHA training and product training. We understand the unique cleaning challenges faced by people in Hawaii, like red dirt, water hardness, etc. Unlike mainland brands we have designed products made right here for in Hawaii to fit the needs of our customers.